The Three Ponds Hotel offers a wide selection of Polish and world cuisine dishes. 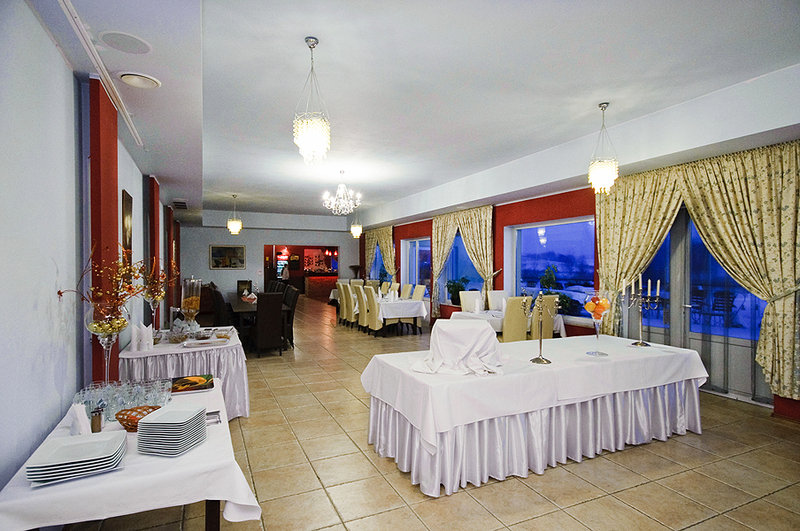 However, our restaurant does not only mean excellent cuisine. It also means stylish, air-conditioned interiors adjusted to both discreet, romantic and business dinners as well as to family occasions for approx. 100 people. It has some features of an elegant restaurant as well as of a charming, quaint eating place. Its atmosphere makes our guests return to taste our dishes again. In summer our guests can savour our dishes on a sunbathed terrace admiring the surrounding landscape. We organize, among other things, wedding receptions, receptions, banquets and other special events, we also offer catering services to offices and institutions. Our personnel will provide you with at least several alternative offers of a reception. The prices and the scope of services are to be agreed upon individually. We are open to all suggestions We would like to invite you to cooperate with us. Additionally, we also organize outdoor meeting combined with roasting a wild boar which can also be delivered to the address given.